We spent our Monday of vacation in Downtown Chicago. We rode the trolley around and stopped at a number of locations. Since we would not be having Italian Beef for lunch, we needed another idea. We had no idea whereabout we may be when lunch time struck so, we didn’t have a set true plan for lunch. No worries – Downtown Chicago offers plenty. We opted on going the sandwich route and select Potbelly. We do not have a Potbelly in Naples yet, Chicago has signs for them all over the place. With the great assistance of Google Maps, we located and arrived at a Potbelly location. Best thing about this spot was that it was inside an office building. Rather than the usual crowd of everyone, the crowd here consisted only of office workers – a definite plus. When we walked into the Potbelly, we saw a fairly long line but, plenty of seating available. A majority of the patrons were getting their items to go. I had beef with the restaurant almost right away due to the fact they did not have any printed menus to view. The only menus were available on two hanging menu boards – both of which were a bit difficult to read from where we stood in line. A Potbelly employee made their way down the line, collecting our orders electronically. When they arrived to us, I was some what flustered in my choice of sandwich. 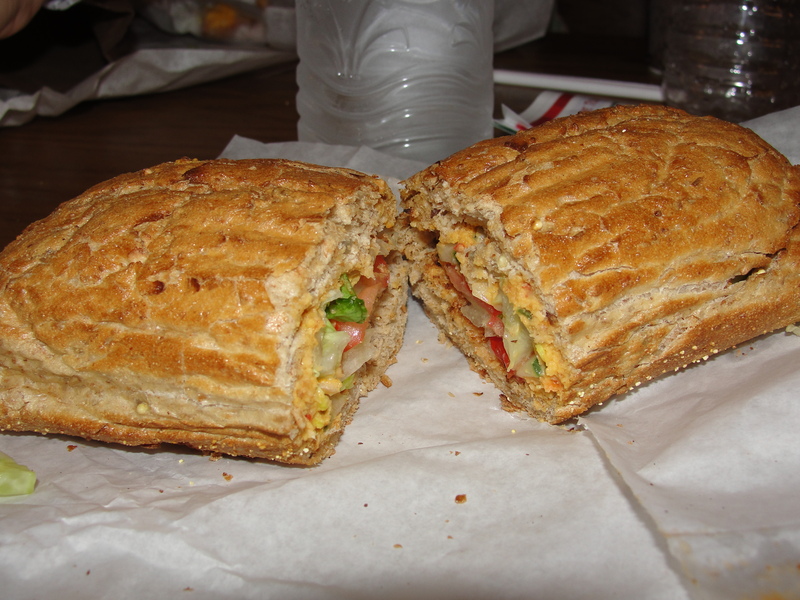 In the end, I opted for a new option – The Mediterranean, on Whole Wheat. The sandwich features: Zippy Hummus, Feta, Artichoke Hearts, Crispy Cukes and Roasted Red Peppers. I decided to leave out the feta & roasted red peppers on my sandwich. I also added on some lettuce, tomatoes & pickles. As we made our way through the line, we selected our chips and grabbed some Oatmeal Chocolate Chip Cookies. After paying and getting our drinks, our sandwiches were ready for pick up. We picked up and found a table. For chips, I did not get my own bag so it is not fair for me to review them. I tried 2 of Taylor’s BBQ Chips and 2 of Mommy’s Puffed-Not-Fried-Or-Baked-Make-Believe-Chips…both were good. I was hungry and dug right into my sandwich. After a bite or two, I was feeling rather unsatisfied – the sandwich was lacking. It was difficult for me to pinpoint why this was and I’m not sure if I will be able to via this blog either. 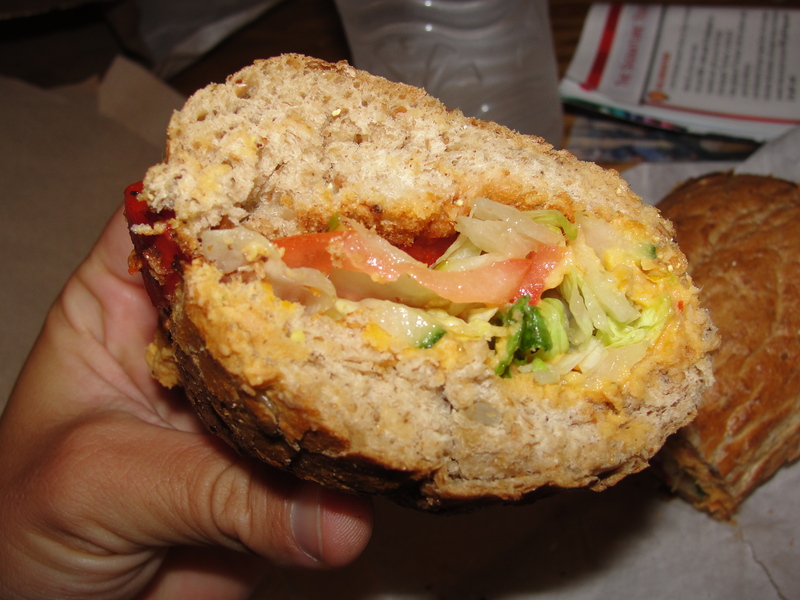 The bread on the sandwich was good – served warm, the whole wheat was soft & had a slight wheat flavor. It more than held up for keeping the sandwich together. As for the zippy hummus, I found it to be very salty and a bit pasty…it just wasn’t very good. I could barely taste the artichoke hearts or the crispy cukes at any time during the eating of my sandwich. The only ingredients I could some what taste was the lettuce, tomatoes and pickles. But even these 3, usually my top 3 in a sandwich, were just okay – they really didn’t make an impression on me at all. The combination of all of the ingredients did not mix in the least. The hummus overpowered nearly all the other ingredients and I felt as if the vegetables were just thrown on. Overall, as I said, this sandwich was just lacking. I finished my sandwich in no time at all and decided to try one of the cookies. Rather than get 1 individual large cookie, we opted for the 12 smaller cookies. 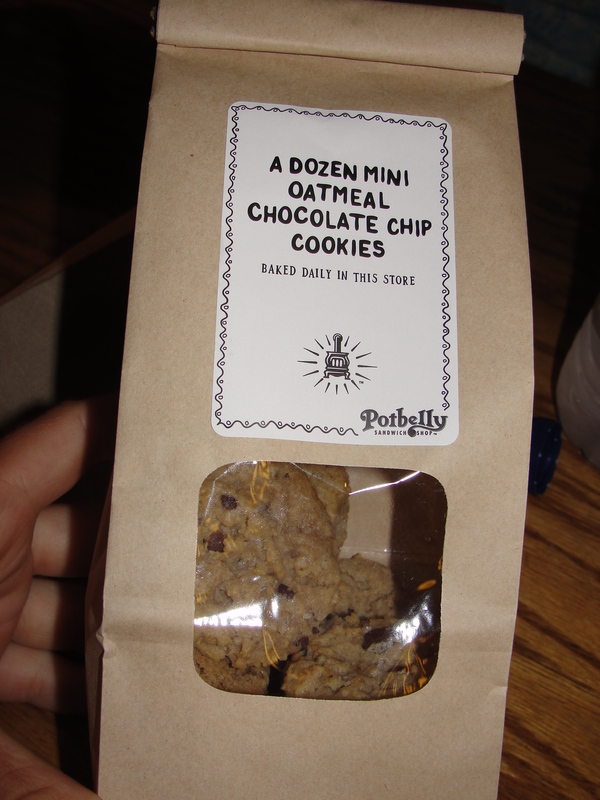 Potbelly makes Oatmeal Chocolate Chip Cookies and, they make them pretty good. The entire cookie had a soft texture to it and was spotted with chocolate chips. I enjoyed how the chocolate chips were the main star of the cookie with the oatmeal playing a supporting role. The cookie was the perfect size to consume in 2 bites and refresh my mouth from that darn hummus. We didn’t finish all of our cookies right away but rather over the next day. Even a day later, the cookie was still soft & yummy.